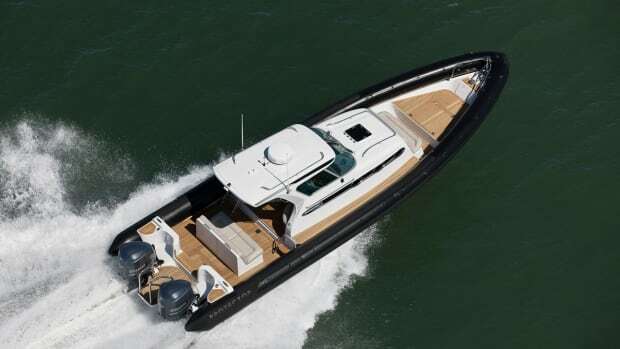 The Protector Targa 30, launched earlier in 2012, is fast becoming the tender of choice in San Francisco Bay. Its large cabin and tough demeanor are perfect for the bay’s sunny but cool days and often windy conditions. The Protector’s performance has received high commendation from the organizers of the Louis Vuitton Cup and participants of America’s Cup. There is nice teak on the Tauranga 38. Yes, the boat does have Hypalon air-filled tubes (with seven chambers), but it is a solid 14,500-pound hand-laid fiberglass boat, built for adventure-minded boaters. Its cabin has plenty of headroom and an enclosed head (which can be made into a shower). When choosing a tender for your yacht, you have a world of options. Here are two new contenders that have recently come to our attention. Maybe they'll catch yours as well.